Diving is a breath-taking experience, try it and you will see! Every day we go to a sheltered, beautiful dive site to offer you a wonderful dive! Sunny days and clear water create the perfect setting for learning how to dive! We offer the best first time experience ever! The PADI Discover Scuba Dive is your first adventure in a completely new world! It will take your breath away! This is something for kids, teenagers, adults and seniors alike – but watch out, you will probably catch the diving virus! Continue the fun: Try it, and if you want to, continue the same day! 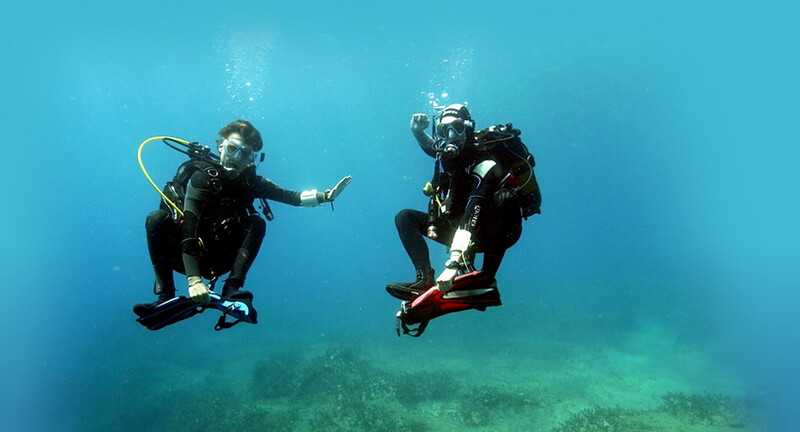 Children from 8 years old can get aquainted with diving by our PADI Bubblemaker program. This is specially developed for children and is all about having fun under water! From 10 years old you can join the PADI Discover Scuba Diving (DSD) program. During this dive you will also learn about dive equipment and you will practice some skills. The PADI Bubblemaker program covers half a day and consists of a short briefing on the beach and a lot of fun under water. It is a private program, 1 instructor takes 1 diver under water to a maximum depth of 2 meters. After a lunchbreak, your PADI instructor invites you to the unique experience of a second fun dive. This dive is at an additional cost. Once you feel comfortable in the water we will continue in deeper water, where you will experience the freedom of gliding weightlessly through the water while observing the fascinating underwater life. After a lunch break, your PADI instructor invites you to the unique experience of an additional guided dive free of skill training. Taking you on a grand tour across the dive site, a breath-taking experience! This dive is at an additional cost.